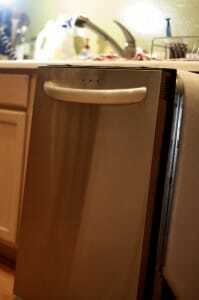 How our dishwasher almost burned down our house. More drama than I’m used to on a Sunday morning. Our house almost burned down yesterday. I walked into the kitchen and saw smoke coming out of the dishwasher. Smoke. Opened it up and tried to turn it off. No go. It was spewing water and smoke and would not turn off. Ohcrapohcrapohcrap. The only solution was to turn off the breakers for the kitchen. Our breaker box is on the outside of the house and is padlocked—it hasn’t been opened since we moved into the house ten years ago. Fortunately, we keep the key on the same ring as the sprinkler system control box key, so I knew where it was. I went outside to switch off the breakers as my wife called 911. Turns out the cordless base station is in the kitchen, so when I threw the breakers, the phone went dead, so she had to call back on her cell phone to cancel the fire truck, but the fire department said they might as well roll out and check on the dishwasher to make sure there was no fire lingering in it. The fire crew that showed up was super friendly and helpful, so a big thanks to the Chandler Fire Department. The house still smells a bit of electrical fire. The big take-away for me is: Don’t leave your appliances running when you’re out of the house. If we hadn’t been home the dishwasher could have literally burned down the house. And know the location of your breaker box and how to get into it. You won’t be thinking super straight when your appliances start burning. « The Arizona Republic finds a "haunted library"